The blade assemblies of the blenders may come apart or break, posing a laceration risk. Haier America has received approximately 60 reports of blade assemblies coming apart or breaking. One consumer reported receiving a minor cut to his hand. Mass merchandisers and specialty retailers nationwide from November 2006 through October 2009 for between $26 and $60. Consumers should immediately stop using the recalled blenders and contact Haier America to receive a partial refund. 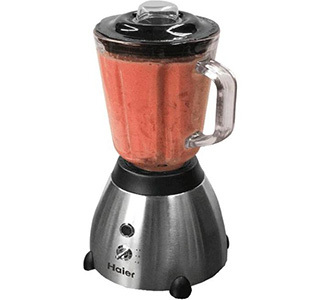 This recall involves commercial-style 500-watt blenders with model number HB500BSS. The units are stainless steel and black plastic. "Haier" is printed on the front below the power switch, and the model number is printed on a label on the bottom of the blenders.